A recent fire here in Jacksonville pointed out the dangers of hoarding. Firefighters respond to a blaze on early Tuesday morning and immediately rescued two occupants from the house. However, when they attempted to go back inside to put out the fire they found themselves hampered by massive walls of junk and rubbish that were burning. There was also no way to tell exactly what type of materials were on fire. The only thing they can do the protect themselves was to pull out and let the structure burn while keeping neighboring properties safe. This is the worst-case scenario for first responders. It also points out the need to get any type of hoarding situation under control. Hoarding is designated as a psychological disease. People who are diagnosed disorder simply cannot throw anything out even if it means creating a hazardous living situation. 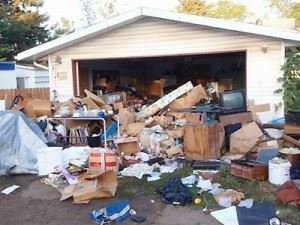 Anyone who has a lot of junk in their yard and throughout the house that wants to get rid of it but doesn’t have the means isn’t really a clinical hoarder. They just need help. That help can easily be found by contacting Junk King Jacksonville. Junk King Jacksonville is part of a nationwide chain of professional junk haulers who has a lot of experience with hoarder cleanup. In those extreme cases, Junk King will work with local therapists to help the person at the center of this situation get the help they need to let go of all the rubbish. Once those behavioral issues have been resolved, the Junk King crews can spring into action. The average junk removal session set up by Junk King Jacksonville is staffed by two very capable movers. But with a hoarder cleanup or help might be needed. Once junk King has made a total assessment of the situation there have no problem dispatching additional crews and trucks to get the job done. The goal is to get out with everything in a single session. A hoarder cleanup also takes up more time than the average furniture removal. The best thing about Junk King Jacksonville is that you would never be charge for that extra time or the extra labor. You’ll fee will be based strictly on how much space your junk will fill up on the back of the truck. One flat fee covers everything. The best approach to a hoarder cleanup is to turn the job over the Junk King Jacksonville today. This entry was posted in Jacksonville junk removal and tagged hoarder cleanup, junk, rubbish on August 28, 2017 by Junk King. Last updated August 28, 2017 .